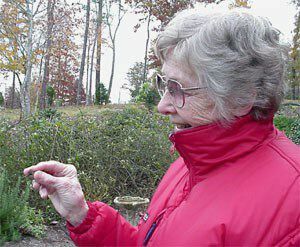 Anne Griffin Shaw, a hummingbird rehabilitator from Greenville SC, has subscribed to the HumNet-L listserv for several years but seldom posts messages. On 12 November, however, she shared the exciting news of an apparent winter vagrant hummingbird coming to her parents' feeder north of Travelers Rest in Greenville County SC. We contacted Anne immediately and set up 17 November as a date we could drive from Hilton Pond Center to attempt capture of the Travelers Rest bird. Adhering to our usually successful technique of trying to catch winter hummers very early in the day, we departed well before dawn and arrived at the home of Paul and Margaret Griffin at 7:10 a.m. Anne was there to greet us and helped move Margaret's feeder into our portable hummingbird trap, which we hung outside the kitchen window. By 7:25 a.m. a hummer made its initial inspection of the trap but wandered off; it returned ten minutes later, entered the trap, and was captured as we hit the button on our remote release. This TrapTripper--created by John Owens--has worked perfectly for us in 2002, the first season we have not used our time-honored pull-string release mechanism. John sells the TrapTripper to licensed hummingbird banders, who then design their own traps to accommodate the device. Some banders use swinging drop doors, but we prefer a sliding drop door and have had no problems catching birds with it. At Travelers Rest, however, as we exited the house and approached the sprung trap from the back, the Griffins' hummingbird found a small gap around the sliding door on the front and scooted out before we could grab it. Bummer! Ever optimistic, we re-set the trap in the hope this hummingbird would return. At 8 a.m. our disappointment abated when once again we captured the bird. This time, Anne approached the trap from the front to distract the bird while we came in from the back and opened a rear access door. This time, we got the bird before it could escape. Based on an abundance of rust color in the tail (above), the new capture was an obvious Selasphorus hummer, and measurements showed it to be S. rufus--a Rufous Hummingbird--rather than the slightly smaller S. sasin, Allen's Hummingbird. 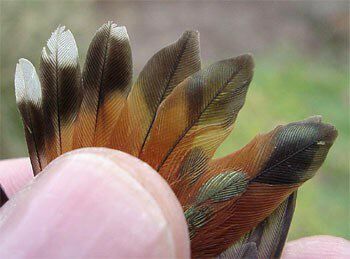 The Griffin's bird--a young male that hatched in 2002--was of interest because it had by far the heaviest throat markings of any Rufous we have handled, but there was only one tiny iridescent orange-red feather; i.e., instead of the solid metallic gorget of an adult male Rufous, this youngster bore a dense covering of slightly metallic green plumage that gave it a distinct "five o'clock shadow" (left). Thanks to Anne for her report to HumNet and to Margaret (below) for allowing us to band her winter hummingbird. As soon as we posted this report to the Web site for Hilton Pond Center for Piedmont Natural History, we went to work cutting some wire to fill that gap in the trap so that no more winter vagrant hummingbirds can slip through! If you're interested in sharing your hummingbird observations and learning from other enthusiasts, you may wish to subscribe to Hummingbird Hobnob, our Yahoo!-based discussion group. 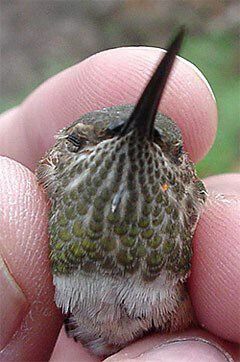 Also be sure to visit our award-winning Web site for Operation RubyThroat: The Hummingbird Project; on it you'll find almost anything you want to know about hummingbirds, including more information about Hummingbird Banding. Students at GLOBE-certified schools may submit winter hummingbird observations as part of Operation RubyThroat and GLOBE. Students can also correlate hummingbird observations with data on abiotic factors, including atmosphere, climate, hydrology, soils, land cover, and phenology. See the "Protocols" section of the GLOBE Web site for details about this exciting collaboration.